Congratulations to both Light Horse Tavern and Union Republic for their write-ups this past week. The Jersey Journal featured the Light Horse Tavern's history, chef, and menu while Union Republic received a review in the NY Times. Hard Grove Cafe is planning on moving into their new space at 143 Newark Ave as soon as August 1st! Taqueria Viva Mexico Kitchen Cafe has been closed for renovations but officially re-opened this week so stop by to admire their new floors and enjoy a burrito. Sorry for the short notice on this one, but tomorrow night from 9pm-11pm, Freshly Baked Gallery and Union Republic are combining to provide an exciting night of art, music, drinks, and food. Check out art from rising talents while enjoying some new dishes from Union Republic's summer menu! RSVP at artfoodmusic.rsvpify.com for a discount on any of the evening's artwork. Choc-O-Pain is offering a new vegan sandwich: sundried tomato hummus, roasted vegetables and oregano on ciabatta. Left Bank Burger Bar is now on Seamless and GrubHub so you no longer need to worry about actually speaking to a human being to get your burgers delivered. Sam a.m. is now selling ModCup cold brew. Summer weekends in Jersey City are in full swing and this weekend is all about the outdoor markets! Today, join Creative Grove at Grove Plaza for some art, music, and food stands. They'll be going from 3-9pm so get outside and enjoy! A couple of months ago, I joined what was Garden State Food Tours for a tour (full disclosure: it was a trial run and I paid a discounted price).Since then, Garden State Food Tours has evolved into Jersey Girls Food Tours and while the name has changed, the tours are staying! The one I went on is called New on Newark and it focuses on several of the new restaurants and cafes that have opened up along Newark Avenue in downtown Jersey City. While the locations can be subject to change depending on availability, you can count on hitting several major spots like Union Republic, Left Bank Burger Bar, Tea NJ & more. Farmers' Market at Lincoln Park - Food Trucks Wanted! This Sunday, June 22nd, marks the start of the Farmers' Market at Lincoln Park. It will run from 10am - 3pm every Sunday from this weekend through November 2nd. Their list of vendors is up on their FB page and it looks they're going to have a great market season! Congratulations to Milk Sugar Love who officially opened at 19 McWilliams Place on Saturday! The Lincoln Park Farmers' Market starts next Sunday and will run from 10pm-3pm every Sunday through November 2nd. Battello now offers valet parking for $10/car. The Riverview Observer shared that the Jersey City Dept. of Health and Human Services is working with the USDA to help provide nutritious, healthy meals over the summer to qualified camps, daycares, and other organizations. Quick Weekend Reminders (and Father's Day Ideas)! Milk Sugar Love is opening today! The store (19 McWilliams Place, also right by Hamilton Park) will open at 11am with plenty of organic ice cream and delicious treats for everyone, including puppy fro-yo! The weekly burger battles at Left Bank are noteworthy for their unique burgers. Besides the already varied and highly customizable menu, the weekly battle provides an opportunity to check out new and extravagant creations from the staff at Left Bank. This week, a burger called The French Dipster is facing up against last week's winner, the Sloppy Joe. I am a huge fan of French Dip sandwiches and as soon as I saw Left Bank's interpretation, I knew I wanted to try it. However, I thought if I was going to try one of the burgers from the battle, why not try both and come up with my own winner? Picnic Baskets Now Available from Sam am & other events! Today, Sam a.m. announced they were ready to start offering the picnic basket service they announced a few weeks ago! They will provide all the essentials including a basket, a blanket, a trash bag (which is a nice touch) and of course, the food! To reserve a basket, email samamcafe@gmail.com with the date and your menu choices. Please note that they may not be able to accomodate your request based upon availability for that date, so book early. Yesterday marked one year since my first post on Jersey City Eats and I owe huge amounts of thanks to all of you who have been reading, commenting, and following me on Twitter and/or Facebook. Your support has been amazing. Over the past year, I've had some fantastic dishes and culinary experiences in Jersey City. There have been new places, new menus, and a huge surge in community and outdoor markets. The food culture has grown by leaps and bounds and I, for one, am incredibly glad to have been able to enjoy it. As you may or may not have noticed, I generally try to avoid ranking places or calling anything "the best". 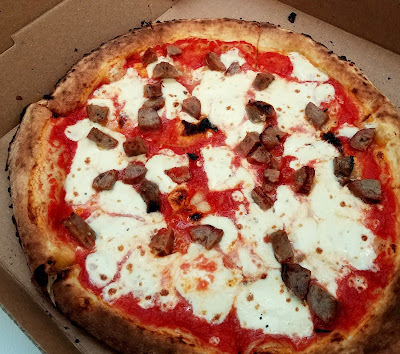 However, I do have many favorites or meals and experiences I consider special and note-worthy for a variety of reasons so I thought the best way to mark one year of talking about food in Jersey City would be to show some of my favorite things I've eaten in Jersey City over the past year. Some I may have posted before; others may not have been. Please note, except for the final item, these aren't in any particular order. The cold brew coffee from ModCup - I've always been one of those people who really enjoy the taste of coffee but ModCup really impressed me with how delicious their coffee is, especially their cold brew. Their dedication and passion for bringing incredibly fresh coffee to the public is evident in the flavor of every single cup. There are a lot of things to love at Andrea Salumeria in Jersey City Heights. Their sandwiches are amazing and while it might seem like sacrilege to not name one of their sandwiches filled with their delicious specialty cold cuts, my favorite so far is Pete's Special Tuna. Not only is it my favorite there, it's one of my favorite sandwiches ever. 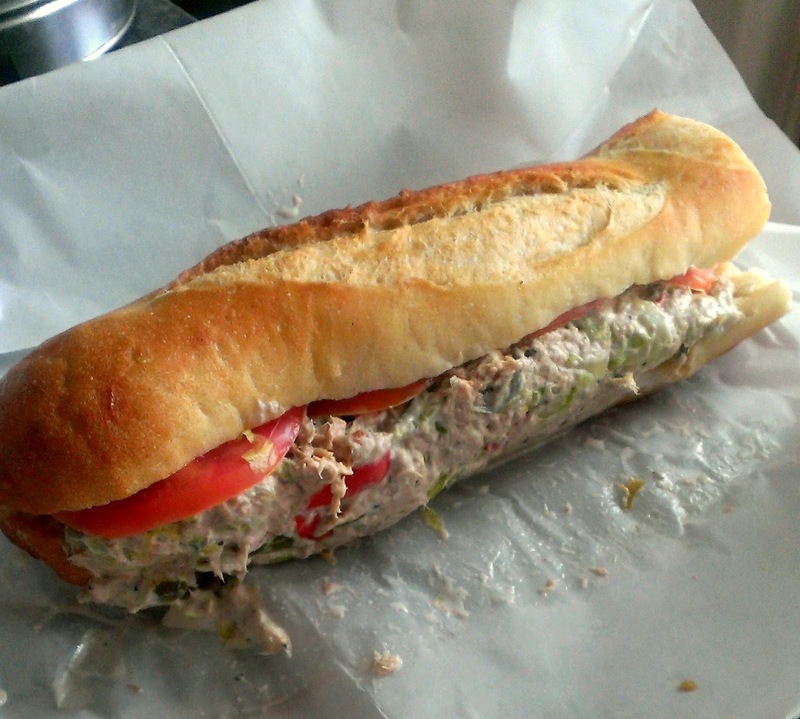 Made with mayo AND oil and vinegar, peppers, oregano, salt and pepper, lettuce and tomato on fresh, nicely chewy bread , it just completely blew away my expectations of what a tuna sandwich could be. It's also giant. Congratulations to former Garden State Food Tours, who have officially relaunched as Jersey Girls Food Tours and they will start running tours at the end of June, so buy your tickets now! Departed Soles, a new brewery, has recently moved into Jersey City where they will be creating both regular and gluten-free craft beers. Jersey City got more recognition from The Village Voice this week with a write-up on the 10 best places to get coffee in Jersey City and Hoboken. Congratulations to all! Cocoa Bakery has a new gluten-free cupcake: chocolate with chocolate glaze! Left Bank Burger Bar has come up with another challenger to face off against the reigning champ from last week, the Holy Molé. This week's contender is the Sloppy Joe: Brisket patty, homemade chili, pale ale cheese sauce, sloppy joe sauce, red onions, and roasted red pepper fritos. This week, the Roman Nose is enjoying Negroni Week by offering classic Negronis, Negronis Sbagliato made with Prosecco, and Negroamaros with Amaro Ciociaro and $1 from each drink will go to support United Way of Hudson County. On Thursday, head to Grove Street for the HDJC Farmer's Market from 4:00pm-8:00pm. You can pick up fresh produce, Stella's Empanadas, vegan food from the Cinnamon Snail, and much more! Check out this great article from Pete Genovese of the Star-Ledger covering some of the best food trucks in New Jersey! Jersey City was heavily represented and congratulations to The Incrediballs, Sahara Grill & Pita, Mordi's, TacoMobile, Dark Side of the Moo for their mentions and especially to Carmella's which was given top honors. Speaking of, local favorite Carmella's not only sells from the truck, but they also have a catering menu available. Beginning today, June 1st, and running through June 8th, Cocoa Bakery is honoring National Cancer Survivor Day by selling special blueberry cupcakes and all proceeds will go to Chemo Comfort. Please help support this worthy cause.